A fabled house. A fabulous fortune. Beautiful, identical twins...a tale of dark shadows and extraordinary deception. Before Ida starts her first day, however, Miss Gregory is found dead. Fearing her one chance of bettering herself lost, Ida goes to the funeral, hoping that someone else from Summersby will still want her. Someone does. Handsome blonde Englishman Mr Samuel Hackett is the late Miss Gregory's fiancé. He expresses a keen need for a housemaid - and a friend. But Miss Gregory's will brings to light an extraordinary deception and a terrible wrong from the past. Summersby has a secret heiress, whose name is also Matilda Gregory...a strange, ethereal girl with an irrevocably broken memory. Who is this mysterious heiress, and why is Ida bound forever to the truth? 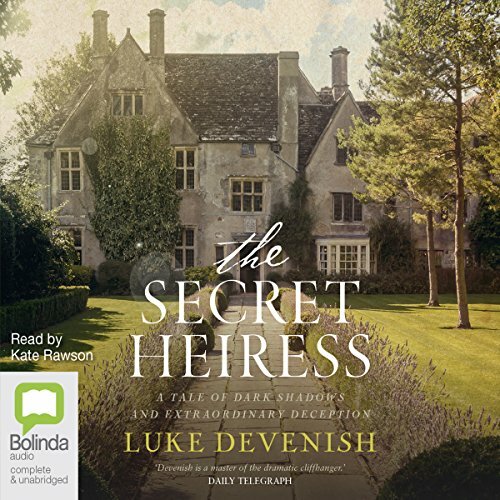 Would you try another book written by Luke Devenish or narrated by Kate Rawson? Definitely not. I chose this book because I read a review saying that Luke Devenish writes similar novels to Kate Morton. This novel has the intrigue and the large manor house lifestyle with a mystery spanning many years characteristic of Kate Morton. But it lacks the character and plot depth of a Kate Morton novel. Perhaps this superficiality would not have been so noticeable had the reader read with more depth. She read the girls' voices in an irritating baby-voice and the rest with a 'fuzziness' which is rather soporific and which heightened the superficiality of the story. The intrigue of the story kept me listening, although not with intense enjoyment, despite the other irritating features.